Kids love sharks! Add sharks to any activity and your students are sure to be interested. 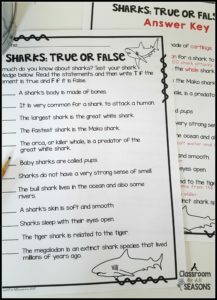 Here is a collection of three free shark activities to use in your classroom. 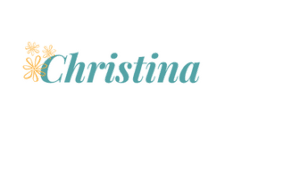 You can use them for Shark Week or any time of the year! They include Sharks: Fact and Opinion, Sharks: True or False, and How Many Words Can You Make From Galeophobia. 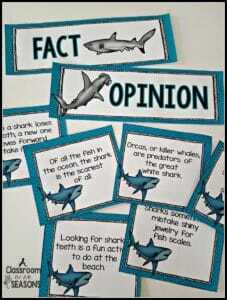 Sharks: Fact and Opinion Sort – Cut and laminate these cards and place in a center or use with early finishers. There are 20 fact and opinion statements plus 2 headers “Fact” and “Opinion”. Sharks: True or False – Test your shark knowledge with these 12 true or false statements. Don’t worry, there is an answer key included! 3. How Many Words Can You Make From….? Did you know the word Galeophobia means an extreme fear of sharks? 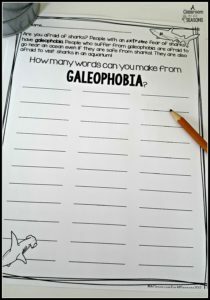 This activity asks kids to write as many words as possible from the word GALEOPHOBIA. 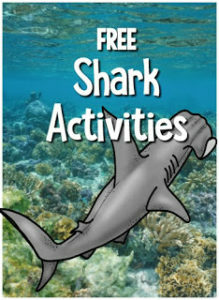 To download these Shark Activities, visit here.